March 15 - April 2, 2012 - The 10th annual Peter French Memorial March Madness Pool was again a wonderful event! It is a tribute to Peter that so many friends and others continue to be loyal pool members each year, eager to support the Peter French Memorial Foundation. With 396 original brackets and 215 Sweet 16 brackets submitted, the Pool raised $3,883 this year. We truly appreciate the 321 people who participated. First place in the original pool went to James Grebinski, followed by Dave Foley, Mario Caporale, Lynne Devaney, Peter Luitwieler, Daniel Ulacco, and Steve Powers. The Sweet 16 pool winner was Kerry Dinneen, with Bill Wolfe, Dianna Deering, and Dave Hansel coming in 2nd, 3rd, and 4th. Congratulations to all, whether they relied on college basketball knowledge or just plain luck! If you'd like to check out the pool website, go to http://peterfrench.hoops.sportsfan.com. Bookmark it and join us next year for more madness! December, 2011 - The Peter French Memorial Foundation was able to distribute $4,000 to The Fund for ARVD at Johns Hopkins University for ARVD research. 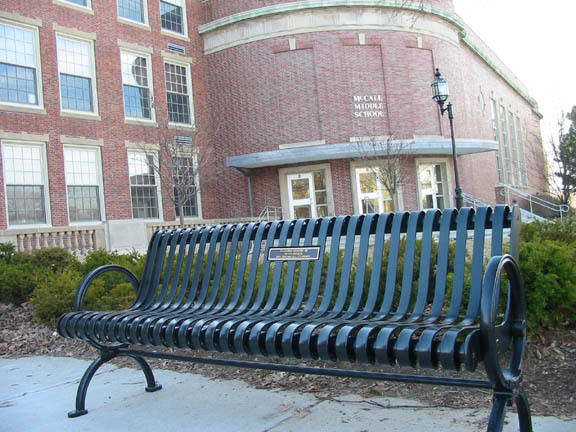 Although this is an excellent use of the funds, we'd rather a grant go to a needy person. If you know of any of Peter's friends, classmates, fellow athletes or other young adult in dire need, please contact us. March 17 - April 4, 2011 - This was the best year yet for the Peter French Memorial March Madness Pool. It's hard to believe that this was the 9th annual Pool run by members of the French Family. It was another crazy tournament with a lackluster final game! We had players enter 386 brackets in the Original Pool and 230 brackets in the Sweet 16 Pool. With half the entry fees going to Peter's Foundation, and further income from many donations, the Pool raised $3,887 - the most ever! Thank you all who entered and donated. The winner of the Original Pool was Kristin Volz, followed by Betsy Kean, Steve Powers, Mike Bosco, Ben Davis, Jen Ryan, and Norm Wolbrom. Krista Sheets won the Sweet 16 Pool, with Kate Fuller Curren, Tom Ribadeneyra, and Richard Crocker coming in 2nd, 3rd, and 4th. Be sure to try your luck in 2012. You may win big money, plus help Peter's Foundation to grow! Here's the link to the website: http://peterfrench.hoops.sportsfan.com. December, 2010 - The Peter French Memorial Foundation made grants totaling $5,000 to the Sarver Heart Center of the University of Arizona and Johns Hopkins University for research in ARVD. Please help us find needy recipients who were former friends, classmates, athletes, or simply young adults in dire need. We know that's where Pete would want the grants to go. March 18 - April 5, 2010 - Once again we ran the Peter French Memorial March Madness Pool, the eighth annual. What an exciting and crazy tournament this year! With all the upsets, most entrants probably felt they would have done better if they'd tossed a coin to make their picks. It was a very successful fundraiser, with 348 brackets entered in the original pool and 232 brackets in the Sweet 16 pool. With half of the entry fees going to Peter's Foundation, the pool raised $2,350. The winner of the original pool was Kimberly Brennan, followed by Charles Sweat, Ed Schultz, Ryan Connolly, Toby Spry, and Alyson Bergin. The Sweet 16 winner was Joe Murphy, with Aly Bergin coming in 2nd, and Bob Deering taking 3rd. Thanks to Van for all his work on the pool this year. See the website at http://peterfrench.hoops.sportsfan.com. December, 2009 - The Peter French Memorial Foundation made grants totaling $5,000 to the Sarver Heart Center of the University of Arizona and Johns Hopkins University for research in ARVD. Please help us find needy recipients who were former friends, classmates, athletes, or simply young adults in dire need. We know that's where Pete would want the grants to go. August 15 & 16, 2009 - The 3rd annual Love to ComPete 3v3 soccer tournament was held again at Skillings Field in Winchester. This was the best year ever, with the tournament doubling in size to 325 competitors coming from as far away as VT, CT, and RI. There were boys' and girls' divisions in U-10, U-12, U-14, and high school, along with a men's open division. It was a very busy, hot, and tiring two days, but with help from our sponsors and our many volunteers, including volunteer referrees, we were able to raise $6,000 for Peter's Foundation. Check out the website at www.lovetocompete.com. March 19 - April 6, 2009 - Another great year for the March Madness Pool! This was the 7th annual basketball fundraiser in memory of Peter. There were 318 brackets entered in the original pool and 158 brackets in the Sweet 16 pool. The winner of the original pool was Steve Pisarra, followed by Mary Starck, Maryanne Hughes, Krista Sheets, and TJ Miklus. Jack Quill came in 1st in the Sweet 16 pool, with 2nd place going to Phil Murray, and Erik McMichael coming in 3rd. With half of the entry fees going to Pete's Foundation, we were able to raise around $2,000. Thank you to all who participated. Check out the website and see all the standings. Go to http://peterfrench.hoops.sportsfan.com. Maybe it will inspire you to enter next year. December, 2008 - The Peter French Memorial Foundation gave grants totalling $5,000 to Johns Hopkins and the Sarver Heart Center at U. of Arizona for ARVD research. We hope to give grants next year to a person or persons in dire need. Please send us referrals if you know of a worthy recipient. Fall, 2008 - Pete's Winchester High School Class of 1993 had a 15th reunion, during which they held a 50/50 raffle. Half the money collected was split between Pete's Foundation and another charity. We thank WHS Class of '93 for its kindness and generosity. August 16 & 17, 2008 - Love To ComPete 2008, the 2nd annual 3v3 soccer tournament, was held at Skillings Field in Winchester. The tournament was a huge success, with close to $5,000 being raised for Peter's Foundation. It included 2 Girls' age groups (U-14 and High School) and 3 Boys' age groups (U-14, High School, and Open). Feel free to check out the tournament website at www.LoveToCompete.com for all the results, photos, and details on the event. A huge thank you to all the players, volunteers, and sponsors for making the tournament such a success! March 20 - April 7, 2008 - It was a great year for the 6th Annual Peter French Memorial March Madness Pool (run by Chris)! There were 371 entries for the regular pool and 168 entries for the Sweet 16 Pool. The winner of the regular pool was Jay Legendre, followed by Amy Elsberry, Matt Colangelo, Joe Foley, John Finnegan, Aidan Montgomery, and Mason Miller. Chris Holman won the Sweet 16 pool, with Van French in 2nd, and Robert Wile coming in 3rd. Congratulations to the prize winners, and many thanks to all the people who entered. With the entry fees plus some additional donations, we were able to raise around $2,500 for Peter's Foundation. If your teams didn't do well, try again next year! December, 2007 - Two grants were given from the Peter French Memorial Foundation this year, totalling $5,000. One was to the Sarver Heart Center at the University of Arizona for continued research in ARVD, and the other was to Johns Hopkins Fund for ARVD. Thank you to all who helped us build the Foundation. Please let us know if you hear about a person in dire need who could benefit from a grant. August 18 & 19, 2007 - We switched our Love To ComPete tournament from basketball to 3 v 3 soccer this year, and it was a big success. There were three divisions of girls' teams and two divisions of boys'/mens' teams, with 39 teams that entered. The weather was perfect, the volunteers were wonderful, and the teams had lots of fun. Chris and family were very pleased with the tournament, which besides being fun, raised over $4,000 for Peter's Foundation. March 15 - April 17, 2007 - Chris ran another great March Madness pool (his 5th), which had 342 entries in the regular pool. The top seven people won prizes. They were (from 1 to 7) Jay Higgins, Rich Cody, Chris Hehn, Matt Fitzpatrick, Lynne Fussteig, Andy Nolan, and Nield Montgomery. The Sweet 16 pool had 136 entries, with prizes going to Sean Dowling, Chris Hehn, and Laura Davis. Thanks to all who entered, Pete's Foundation made over $2,000. December, 2006 - The trustees of the Peter French Memorial Foundation were pleased to be able to give two grants totalling $4,000 this year, one to Johns Hopkins Medicine to fund continued research in ARVD and the other to the Sarver Heart Center at the University of Arizona to help fund a critical symposium on ARVD in May of 2007. Saturday, October 28 - Mike Morris presented another of his famous benefit Halloween Parties. Each year he donates all proceeds to charity, and this year the Peter French Memorial Foundation was a beneficiary of half of the proceeds, totalling $1300. Many thanks to Mike (and to Van, for volunteering to DJ for the night). 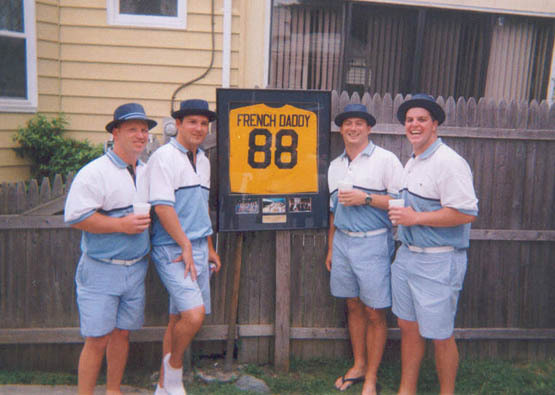 August 26, 2006 - The 5th annual Peter French Memorial Golf Tournament was held at the Jamestown Golf Course in RI. Van again organized this fun tournament, where lots of Pete's friends got together for a day /weekend back in the old haunts of Newport. After a competitive match among the nine foursomes, the winning team was "Better Without JK", including Rob Thatford, CJ (Chris Joseph), Mike Morris, and Ken J. They ended up -4 in this "best ball" tourney. A barbeque followed, with a raffle for 4 Celtics tickets (courtesy of Julie DelMastro). All proceeds went to Pete's Foundation. Hopefully, this jovial tradition will continue, though probably it will move to Massachusetts. August 12, 2006 - Chris again organized and directed Love To ComPete, the 2nd annual 3 on 3 basketball tournament, which was held at the Manchester Field courts in Winchester. Teams from the Greater Boston area competed in two divisions - boys' high school and men's open. 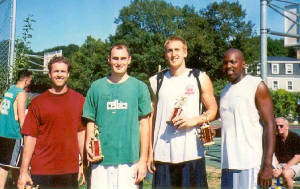 The open division winners were Team Netgain, led by former Miami star Anthony Taylor. The winners of the high school division were the Silver Palate, a group from Chelmsford High School. We had quite a few sponsors this year, so we were able to raise about $2,800 for Pete's Foundation. Many thanks go to Coach Quinton Dale (Pete's H.S. coach) for helping with the planning and day-of organization. Our volunteers were a tremendous help, and we especially appreciate the time Pete's close friend Dean McClearn put in. For more information, visit the tournament website at http://www.LoveToCompete.com. March 12 - April 3, 2006 - Chris organized the 4th Annual Peter French Memorial March Madness Pool. For the 4th straight year, the number of participants increased as this year's total reached 292. With half of everyone's entry fee going to the Foundation and other generous donations along the way, we were able to raise $2,645. Many thanks to everyone who participated! For more information on the tournament, check out the pool website at http://peterfrench.basketballpool.net. December, 2005 - Since there were no applicants for temporary financial assistance, the Foundation was able to disburse $2,000 to Johns Hopkins Medicine for ARVD Research. We hope that you will continue to keep the Foundation in mind for any possible future recipients (see Foundation page for eligibility requirements). 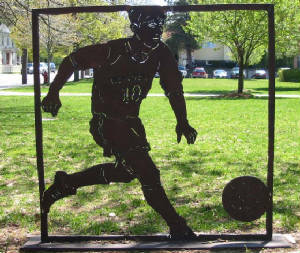 November 23, 2005 - A metal sculpture of Peter was dedicated outside McCall Middle School as a gift to Mr French. It shows a likeness of Pete in action that many of you will recognize. We wish to thank the Winchester ABC (A Better Chance) Program for sponsoring the fundraising effort that led to the sculpture, the Department of Public Works for placement in the ground, and especially Madeleine Lord, the highly talented sculptress who donated her services for this project and did such a marvelous job of capturing Peter's spirit. August 27, 2005 - Van organized the 4th annual Peter French Memorial Golf Tournament. It was held again at the Jamestown, RI Golf Course, with eight teams of four playing "best ball" format. Defending champs, "Who's Your Caddie" were considered the favorites but it was two other teams who tied for the lead after nine holes. A tie-breaking putt off was held at the putting green with "The Dongs" (Travis, Brian, Ian, and Brett) emerging as the new champions. A cookout was held at the course immediately following the tournament for all the participants. In addition to the BBQ, there was a Beirut tourney and a raffle for 4 floor seats to a Celtics game (thanks to Julie DelMastro!). All proceeds went to the Peter French Memorial Foundation. The weather was perfect and the all the people who came down to Newport to participate made it a great day. We look forward to doing it again next year. 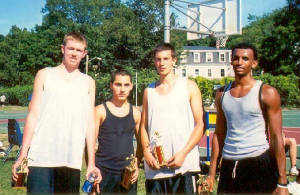 August 6, 2005 - Chris organized and directed HoopFest 2005: Love To ComPete, a 3 v 3 basketball tournament at the newly renovated outdoor courts in Winchester. Players came from all over the Greater Boston area to compete in the two divisions - Boys' High School and Men's Open. Friends of Peter who put in a lot of effort recruiting players and also playing in the event were Brian Keefe, Kirk Minihane, Jamie Morrison, and Quinton Dale (Pete's WHS coach). All proceeds from the tournament (just under $1,300) went to the Peter French Memorial Foundation. For all results, pictures from the event, and further information, visit the tournament website at http://www.LoveToCompete.com. March 13 - April 4, 2005 - Chris organized the 3rd Annual Peter French Memorial March Madness Pool, which was once again a big success. With half of everyone's entry fee going to the foundation and other donations along the way, the pool raised around $1,600 for the Peter French Memorial Foundation. A record number of people participated this year, so hopefully it will continue to grow each year! For more details, you can look at the pool's website at http://peterfrench.basketballpool.net. December, 2004 - Since there were no applicants for temporary financial assistance, the Foundation was able to disburse $2,000 to Johns Hopkins Medicine for ARVD Research. We hope that you will continue to keep the Foundation in mind for any possible future recipients (see Foundation page for eligibility requirements). 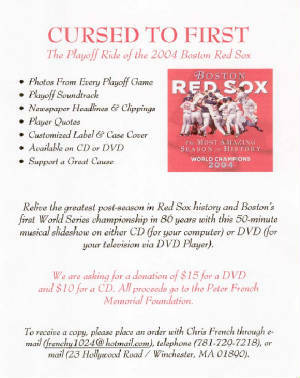 November 22, 2004 - Chris made "Cursed To First: The Playoff Ride of the 2004 Boston Red Sox," a 50-minute musical slideshow on both CD and DVD. All proceeds from the sales went to the Peter French Memorial Foundation. After selling over 200 DVD's and 20 CD's, roughly $3,000 was raised (see photo below for more information). 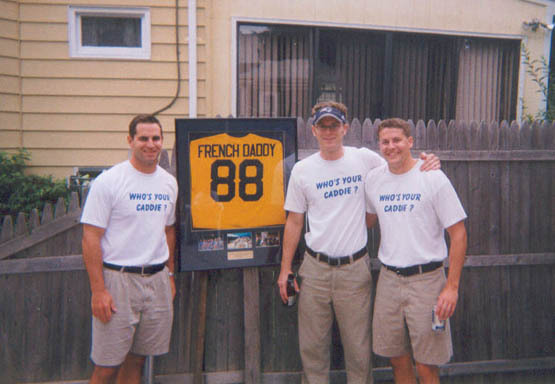 August 28, 2004 - Vandy organized the 3rd Annual Peter French Memorial Golf Tournament, which was held again at the Jamestown Golf Course in Jamestown, Rhode Island. After a fun afternoon of "best ball" play, "Who's Your Caddie" (Ted Keenan, Dan Hennessy, Ned Burke, and Eric Poydar) came out on top of the nine-team tournament. March 18 - April 5, 2004 - Chris organized the 2nd Annual Peter French Memorial March Madness Pool. An amazing 196 people participated in this year's pool, with Mike McDonough winning the $500 first place prize (Allison Abate, Chris Young, Zac Kraft, and Tim Chrystal rounded out the top 5 cash prizes). Just as last year, half of everyone's entry fee went to the winner's pool and the other half went to the Foundation. That total, along with many extra generous donations, allowed us to raise just under $2,000 for the Foundation. We hope to improve on that number next year, so if you, or someone you know, would like to participate next year, contact Chris to be placed on next year's list. August 2, 2003 - The 2nd Annual Peter W. French Memorial Golf Tournament was held at the Jamestown Golf Course in Jamestown, Rhode Island, organized by Vandy. Fifteen teams of four participated in this "best ball" format of play, which was followed by a barbeque at the clubhouse. The golf may not have been too great, but the fun and fellowship made up for it. 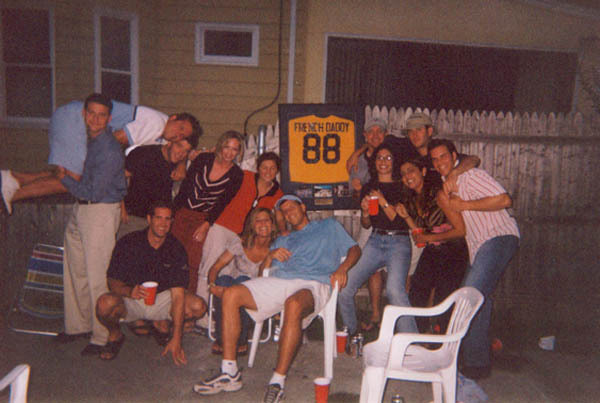 May 17, 2003 - Dean McClearn and Vandy organized the Stu 2 Booze Cruise, which was both a fundraiser for the Peter French Memorial Foundation and a great night out on Boston Harbor. A huge turnout of friends and supporters made it a fun and successful event. April 29, 2003 - A Service of Remembrance was held at the First Congregational Church in Winchester, during which family and friends read poems and shared memories. A casual buffet dinner followed. 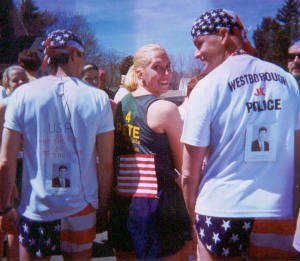 April 21, 2003 - Mike Quaranto, Jon Kalagher, and Jackie Carr ran the Boston Marathon in Peter's memory. Out of the thousands of runners, Mike and JK, who each had a picture of Pete on the back of his shirt, spotted a girl in a "4 Pete" shirt, who turned out to be Jackie. March 20 - April 7, 2003 - Peter's brother Chris organized the 1st Annual Peter French Memorial March Madness Pool, in which 172 people participated in a pool/fundraiser. Each participant paid an entry fee and the total sum of the money was divided in half. Half the money went to the top 5 finishers in the pool and the other half was donated to the Peter W. French Memorial Fund. Thanks to such an amazing response and overwhelming generosity, we were able to add around $1,500 to the fund. Chris hopes to carry on the success of this year's pool and make it a yearly tradition. 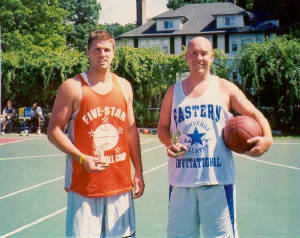 December 21, 2002 - The annual Winchester High School Alumni Basketball Game was dedicated in part to Peter. Each team wore shirts with P.W.F. printed on the back. Over 20 alumni showed up to play in the game, as well as a significant crowd to support the game. Mark Sullivan and Kirk Minihane spear-headed the fundrasing effort and were able to make a nice donation to the Peter W. French Memorial Fund. October 13, 2002 - Jackie Carr ran the 26.2 mile Chicago Marathon in memory of Peter. She also plans to run the Boston Marathon in the spring, again in his memory. 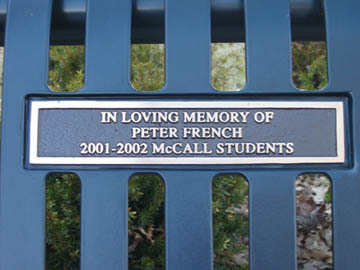 September 24, 2002 - The McCall students of 2001-2002 dedicated a bench in the front of McCall Middle School (of which Mr. French is the principal) in loving memory of Peter. Members of the 2002 graduating 8th Grade Student Council, the Student Council Advisors, and McCall parents participated in the dedication, as well as Mr. and Mrs. French. September 14, 2002 - Shaun Oliver and Amy Hall (as "Team Frenchy") raised more than $1,800 for the American Heart Association in memory of Peter by participating in the American Heart Walk, a 6-mile walk through Boston. 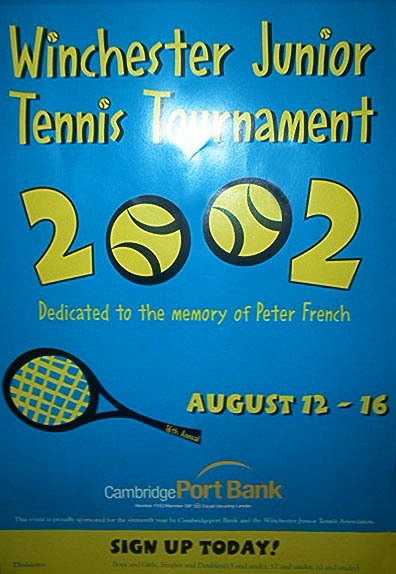 August 12-16, 2002 - The annual Winchester Junior Tennis Tournament was held in memory of Peter. The article in the local papers stated: "This year's tournament will be dedicated to the memory of Peter French. Peter was a past winner of the tournament in both singles and doubles. Peter was a good tennis player, but most importantly he set a great example by his good sportsmanship and good behavior both on and off the tennis court. He will be missed by all who played tennis with him, as well as all who knew him." July 27, 2002 - The First Annual Peter W. French Memorial Golf Tournament was held at the Jamestown Golf Course in Jamestown, Rhode Island. Fifteen teams of four enjoyed the event, which was organized by Vandy and included a nine-hole competition with prizes and a barbeque.